The Kilkenny Gospel Choir welcomes choirs from all over the world to join them for Faith, Fun and Friendship in the Medieval City of Kilkenny. Come join us through the year to celebrate all that we have in common in music, culture and friendship. If your choir is visiting Ireland contact us for our programme of Welcome. From here you can find out when we’ll be performing, read our latest news, view photographs and videos of choir performances and learn the history of the Kilkenny Gospel Choir. Our current album, Somebody’s Praying, is also available to preview and buy online by visiting the music section. The Kilkenny Gospel Choir was founded in 2000 by Fr. Willie Purcell, current director of the choir. In the time since, we have raised over €4500,000 for charities, released one single and three albums. 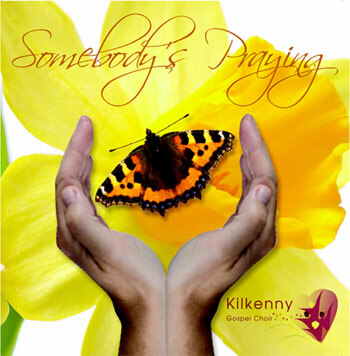 The album, Somebody’s Praying, was released in March 2008 in aid or the Irish Cancer Society and Cancer Care. We are delighted to boast that our choir is an international one in the past eighteen years we have had members from every county in Ireland as well as from Germany, France, England, Austria, Kenya, Zimbabwe, Nigeria, Tobago and Congo. Click to learn more about the Kilkenny Gospel Choir.